I recently had a conversation with a business reporter on the trend among companies to “eliminate” email. The concern is that too many workers are spending far too much unproductive time glued to their laptops. While email volume is clearly a growing concern, I’d like to put the issue in perspective. You don’t need to ban email to make a major dent on email overload. One of the key elements of our recent campaign with a global healthcare company was our “Email Personas” to help employees identify and tackle bad email habits. While we created personas unique to our clients culture, here's another popular set we've made. These personas were a funny and effective way to pinpoint the classic bad behaviors that we all use, but that contribute greatly to overload. 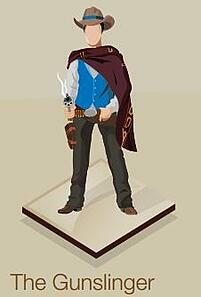 The Gunslinger – Charges into the wide open Wild West – a rebel without a clue – and fires off large group emails. He also responds by hitting “reply all,” instead of considering who really needs the message. It’s time to pull in the reins and determine the best fellow travelers. This type of campaign has already produced a nearly 20 percent reduction in email across another global company we worked with -- in just six months. While the work with our healthcare client is in the early stages, the initial signs are extremely promising as well. For years, the discussion around email volume centered on work-life balance and employee stress caused by emails coming in at all hours of the day and night. 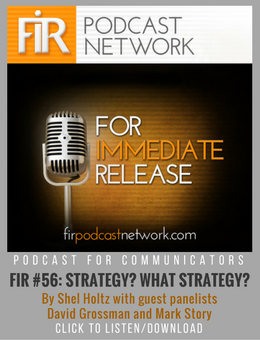 Irrelevant email costs $909,000 per day and $236 million per year. Supervisors spend the most unproductive time on email – an average of 4 hours on email per day. 57 minutes of that time is spent on irrelevant email. 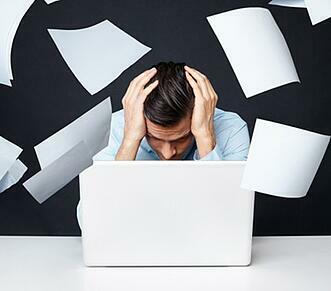 Before you can do anything about email volume, first understand the stress caused by email overload in your organization. With that knowledge, you can get to the best possible solution for your company. Establish a baseline for email overload. Understand how email misbehaviors cause stress and limit your employees’ productivity. Create guidelines for email. Help the organization make the most of email, in keeping with your culture. Walk the walk. Actions speak louder than words. Help leaders follow the behaviors they wish to see in others. Offer email training and provide opportunities for employees’ to self-identify their own email misbehaviors. Humor, when used correctly, can help reinforce the right behaviors in a memorable way. While one of the most publicized efforts to “eliminate” email was from the global technology firm Atos, others have followed suit. German car and truck maker Daimler recently launched a seemingly radical solution of its own: no email on vacation, guaranteed. Still, those more radical moves remain deviations from the norm. A number of researchers and communication experts – including The Grossman Group – have suggested new ways to diversify communications. One of the most popular options are a variety of enterprise social media platforms, which allow employees to opt into conversations and news feeds that are most meaningful to them. Clearly, employees can’t curb email volume if their own leaders send them an inordinate number of irrelevant emails, or if leaders include too many people with every communication. Executive training can be a key to addressing the problem. A recent Harvard Business Review article highlighted the experience of a London-based company, International Power. The firm’s seven-person management team wanted to increase efficiency, and initially figured there was a problem with too many lower-level employees sending emails. Instead, the managers were shocked to learn from a detailed analysis that they personally sent an average of 56 messages a day. The executive team went through trainings to reduce their email volume. As a result, the team’s total email output dropped by 54%, HBR reports. If you want to make a big impact on email volume, be sure that you’re reflecting the culture of your organization. The fact is that many employees rely on email and actually appreciate it as a key communications tool. According to a December 2014 Pew Research study, email ranks as the most important digital took for workers who use the Internet. Some 61% of workers who use the Internet say email is very important to their jobs, according to this study. At the Grossman Group, we wholeheartedly believe that workplace email will remain a key communication vehicle in the immediate future. 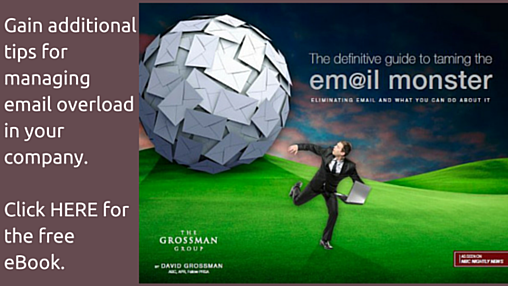 It’s not about eliminating email to be more effective. Instead, it’s about choosing the right vehicles for the message. The encouraging news is that progressive companies are recognizing that the email monster inside their firms can indeed be contained, making their workforces more productive, engaged and ultimately, more successful. Which better email practice does your organization need to work on the most? Check out our Email Research and Resource Center. It's filled with our research on the state of workplace email, insights on recent email trends, and tools for achieving a clutter-free inbox.